Lilibeth Cuenca Rasmussen, born in 1970, is an interdisciplinary performance artist who works in Denmark. She studied Art at the Royal Danish Academy of Fine Arts in Copenhagen. In her artistic work, in which she often combines installation formats with photography, live music and video art, she critically addresses questions about identities, gender, cultures and social relationships. Her video piece Absolute Exotic was part of the exhibition Global Feminism 2007, organised by Elizabeth A. Sackler at the Center for Feminist Art at the Brooklyn Museum. In 2008, Rasmussen won the Eckersberg Medal, awarded by the Royal Danish Academy of Fine Arts. In 2011, she co-designed the Danish pavilion at the Venice Biennale. In her performances, the audience is often playfully involved in the action and encouraged to interact. Thus, in 2015, she created a seven-day long performance, performed for five hours each day, Being Human Being. During the performance, the artist set up a creative workshop with the audience and invited guests, in which the participants created body prints, sculptures and footprints out of clay, thereby approaching the question of the origins of humanity. 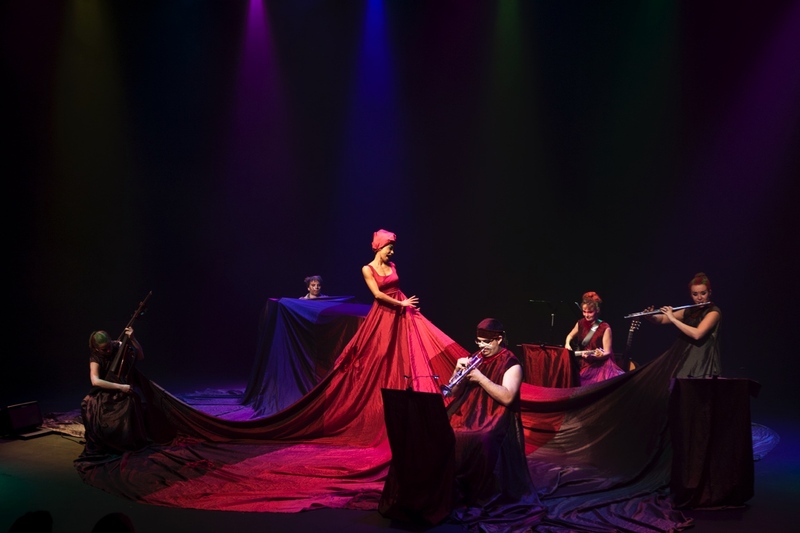 In 2015, in collaboration with Anik Lazar, she created the sound performance Delicate Bridges, in which the audience was asked to compose a piece of music based on elements from the two artists’ costumes. She took a similar approach in performance Body Compositions#1 (2016), in which the bodies of the performers themselves functioned as musical instruments and could be played by the audience using the help of technical equipment. 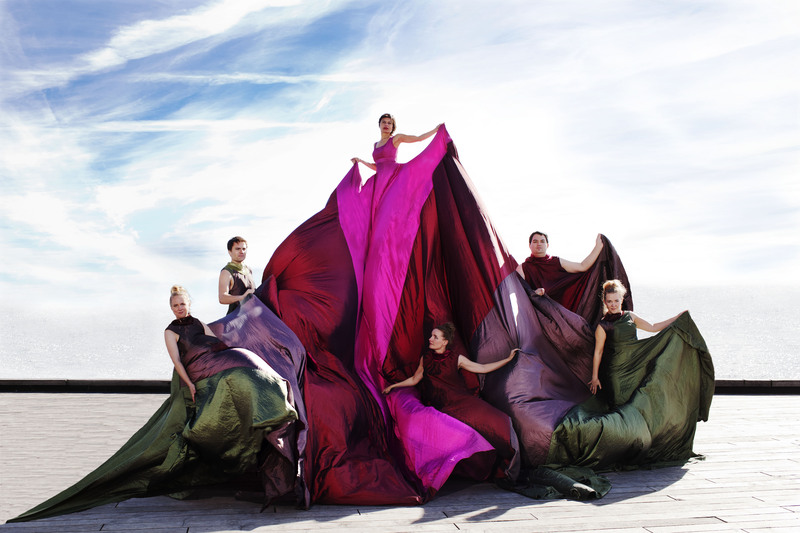 The performance Gaia, which will be performed at NORDWIND, was developed by Rasmussen in cooperation with the classical ensemble Lydenskap. In her work developed for NORDWIND, Lilibeth Cuenca Rasmussen creates an ethereal stage set made of fabric, which is always in a state somewhere between stillness and movement. The installation is a costume, musical instrument and stage set at the same time, using hiding and disguise, but is also the expression of beginning and end, exit and entrance, origin and dissolution and the temporality of all manifestations. Working with musicians from the Lydenskab Ensembles for classical music, Rasmussen and her dancers interact with the floating set until it becomes a performer itself: apparently motionless, then vibrating and unstoppable. Lilibeth Cuenca Rasmussen, born in 1970, is an interdisciplinary performance artist who lives in Denmark. Her video piece Absolute Exotic was part of the exhibition Global Feminism in 2007, organised by Elizabeth A. Sackler in the Center for Feminist Art at the Brooklyn Museum. In 2008, Rasmussen won the Eckersberg Medal, an award from the Royal Danish Academy of Fine Arts. In 2011, she was part of the Danish pavilion at the Venice Biennale.